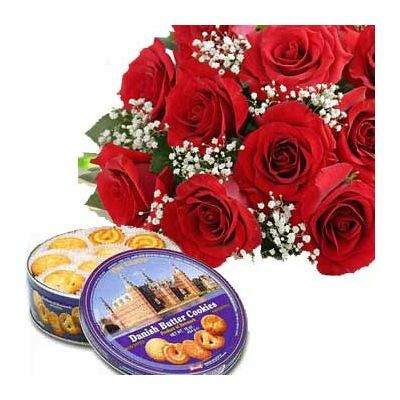 Expressing lots of words by sending this beautiful 12 stems of beautiful red roses and Danish butter cookies(350gms) is perfect for any occasion.Our Roses with Cookies is a nice gift hamper you can send to those close to your heart. 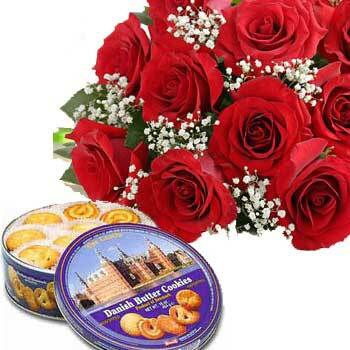 It consists of an elegant rose bouquet and a 500 gm box of Danish Butter Cookies. The 12 lovely red roses are arranged attractively with greens and fillers by our florist. Send roses bouquet online with the cookies box as a thank you gift. You can also send this charming hamper to your dear ones on the happy events of their lives such as wedding, anniversary,birthday, graduation etc. You can also send this thoughtful gift just to say how much they mean to you. We offer home delivery service, same day delivery service and midnight delivery service.